We are tied to the ocean. And when we go back to the sea, whether it is to sail or to watch [or to fish]—we are going back from whence we came. The only thing better than owning a boat is having a great friend who owns a boat. This week I will set sail for New England, leaving from Annapolis and the Chesapeake Bay with skipper and lifelong friend Lex Birney and a hale and hearty crew of four more, on his magnificent sloop, Arcadia. This is our third such trip in as many years—the last to Mt. 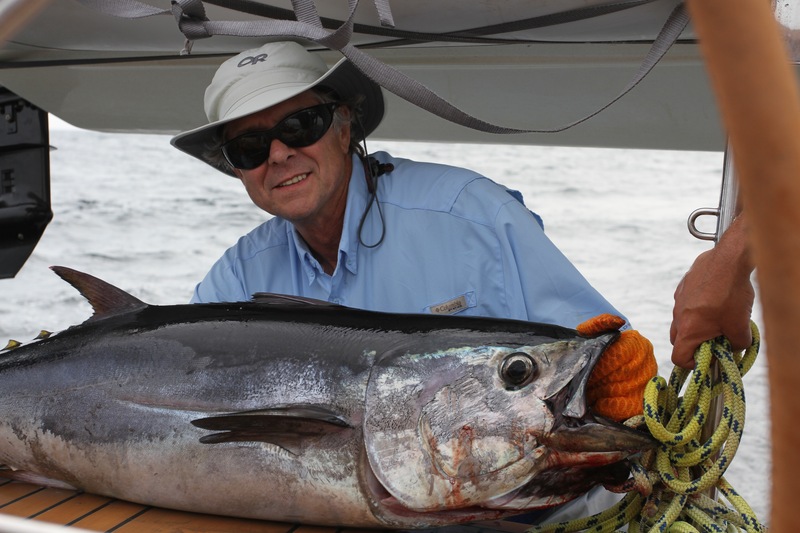 Desert Island, Maine—600 miles of blue-water sailing and an 80-pound bluefin tuna. But that’s another story. Being on the water is vital to me, a reminder of why I do what I do. Over the coming week, I want to share some of our crew’s adventures, the sights that we see, and our sources of inspiration. You can follow us along each step of our journey on this Google map, view photos here on this blog, read a few fishy tales and perhaps be re-inspired yourself. We set sail Tuesday morning, July 8 at 0900. I grew up on the Chesapeake Bay. My father kept a boat, curiously named Cocaigne, in Oxford on Maryland’s Eastern Shore, our refuge from suburban Washington at a time when blue crabs, oysters, rockfish, and watermen seemed plentiful and the Eastern Shore wasn’t cool. I lived on that boat for four summers during high school and part of college, and everything I learned about how mechanical things work, and how to fix just about anything, came from the necessities of boat maintenance. It helped that I had a job as a cabinetmaker’s apprentice, training that would be a precursor to my first career in the building business. My appreciation for the water would emerge from living in that small town inextricably linked to the early history and bounty of the Chesapeake. I never thanked my father enough for that amazing opportunity and exposure. I distinctly remember when my father affixed the newly formed Chesapeake Bay Foundation’s “Save the Bay” sticker to our family wagon—a symbolic gesture, for a modest donation, that I will always remember. That was around 1969, a critical time in the movement to protect the Bay. Fast forward to 1982, shortly before my father would sell the boat, my wife, Libby, and I spent our honeymoon on the Bay (I’d say on Cocaigne, but that would be hard to explain). Thanks to my father’s trust and generosity, we covered about 350 miles “gunkholing” just a handful of the many coves and tributaries of the Bay—from Oxford to Crisfield, across to the Rappahannock River (and a few nights in a real bed at The Tide’s Inn), up to Solomon’s Island, on to Annapolis and a visit with Captain Lex, and across to St. Michael’s and back to Oxford. Fun to remember a “Just Married” sign affixed to the stern. Crossing the bay to the Rappahannock River, we ran into some special friends of the family at The Tide’s Inn and received our most surprising and original wedding present. When we went to check out, we were informed that someone had paid our bill. What can you do except say “wow” and try to pay it forward? After the honeymoon, like anadromous fish who swim from the ocean into freshwater tributaries to spawn, we followed our instincts and headed up the Potomac River to the confluence with the Shenandoah River and settled in Shepherdstown, arguably the oldest town in West Virginia. We now have a little land and a home across from mile marker 72 on the C&O Canal. My first project as a self-employed construction manager was to build a new building for Blue Ridge Outfitters and their rafting operation on the Shenandoah River. The general manager at the time was Tom Conant, another lifelong friend, occasional Arcadia shipmate, and now owner of Studio 105, a vital part of The Downstream Project creative team. Shortly after arriving in Shepherdstown, I met a recently retired gentleman from the United States Fish and Wildlife Service, Ben Schley. He was then a writer published in several national sporting journals and a local nature column. He had an unmatched passion for the outdoors—for hunting and for fly fishing—and he quickly became my mentor. We bought his small cottage next to his main house, and as a neighbor, he became a constant companion. In 1989, he took me to Yugoslavia, where he had worked on a hatchery project for the USFWS. I received my indoctrination in to the wonders of international fly fishing in a pristine landscape. We released some of Ben’s ashes in “the Horsebacks,” his favorite stretch of the Potomac above Shepherdstown, and I still love to fish with Ben, no matter how many parts per billion. During this same time, I served as a volunteer administrator for the Shepherdstown Presbyterian Church. I was learning a lot about nonprofit administration and finance, but I learned more about earth care as our congregation committed itself to thoughtful stewardship of the planet, a process that, as my oldest son said, put me in touch with my inner liberal. Out of the blue, the opportunity to join The Downstream Project presented itself in 2008 in time for the release of Downstream’s inaugural project, the 52-minute documentary: Shenandoah, Voices of the River. It was like a job that had been handcrafted for me—the confluence of so many of the passions of my life. I am grateful to my friend Tom, at Studio 105, for introducing me to George Patterson and conservation champion, George Ohrstrom, founder of Downstream, an association that has inspired these pages and the evolution of The Downstream Project as a growing force for change in the conservation community. That’s the back story, so now it’s time to get wet! Let’s go sailing.